Description: A good old set of by now a days standards, Old School power powers Q544 and check out those pulp wood cars! This was the last train I ever shot with a string of these former ACL 50' cars loaded. Power is CSX SD40-2, HLCX SD40-2,HLGX C36-7E & CSX C30-7. Description: An eastbound CSX detour train waits at Susquehanna as Q 271 pulls away from the meet. Ill chase Q 271 back to Binghamton. The water tower support is for the tower that once supplied water to the Erie car shops, which stood beyond the train for over 100 years. Description: Taken from Metro-North Train #60 to Hoboken approaching Campbell Hall Station. Description: F701 at WS jct. Description: These engines are parked on a secton of track that was the old WSSB ry and was pulled up south of the signal. The line to the left of the signal is the connection to the CSX main to Hamlet at WS jct. Description: CSX 8321 (ex-L&N 1245) pulls into Manchester for a crew change before heading to Birmingham, AL. 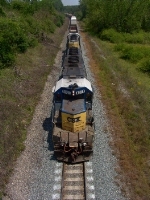 Description: Three different SD40-2s handle an autorack train. The lead unit, CSX 8321, is painted in the older stealth paint scheme. Description: K185 departs Ottawa siding after a meet with K598. Quite unusual to see non-AC power on this train. Description: Q326-?? really early at the East End. Description: After my bowling leagues on Saturdays, I would usually stop down in Bethlehem to see what was running. Here, 11J heads west at CP 88. Description: BNSF Eastbound Freight Train departing BNSF's Yard in La Crosse, Wi.